WBT and K107.9 The Link bring the annual Holiday on Ice skating rink at the NASCAR Hall of Fame Plaza, the rink is open through Jan. 6, 2019. Special events include Princess and Superhero Day on Dec. 9. Admission is $10 for all-day skating, and skate rentals are $4. Standard hours are Wednesday through Friday, 5-10 p.m.; Saturday, 10 a.m.-10 p.m.; and Sunday, 11 a.m.-7 p.m., and 10 a.m. to 10 p.m. weekdays when Charlotte-Mecklenburg Schools are out. Ease onto the Charlotte Motor Speedway for a 3.5-mile loop around the track to see more than 3 million lights synced to music. Speedway Christmas is open daily Nov. 18-Dec. 31, 6-10 p.m. The Christmas Village, which includes a petting zoo, a Bethlehem village, photos with Santa and new this year: a 50-foot Ferris wheel, is open Thursday-Sunday, Nov. 18 through Dec. 31 from 6-10 p.m., and every evening Christmas week. Add in a drive-in movie experience Thursday through Sunday with the giant Speedway TV that casts favorite holiday movies. See the website for movie schedule. Tickets range in price from $20-$30 per car depending on day of week. Carowinds comes alive with holiday spirit during WinterFest. Friends and families are treated to an ultimate holiday celebration as Carowinds magically transforms their park into a winter wonderland. WinterFest is packed with all the sights, sounds, food and experiences of the holiday season. Festive fun and hands-on holiday activities are located throughout the park, and sweet aromas from special holiday dishes and desserts fill the midways. Plus, up to 24 of your favorite rides will be open to complete your night of memory making! 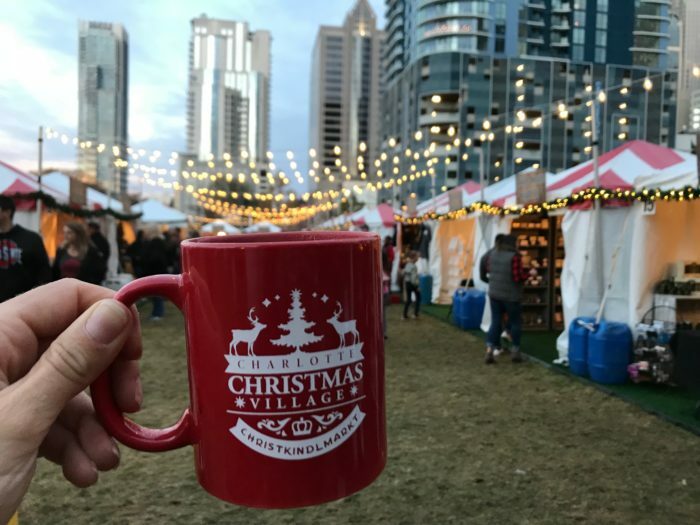 Charlotte’s Christmas Market is a new Queen City tradition! The aromas of specialty foods will drift across the village, from classic Austrian strudels, Bratwurst with Sauerkraut, and glazed nuts. Visitors can also enjoy hot mulled wine, cider, hot chocolate and alcoholic-free Glühwein in a souvenir village mug! Open daily (except Mondays & Christmas eve) at 11am through Decemeber 24th 2018. This treasured tradition in the Charlotte area will open this Friday, November 30. McAdenville (also known as Christmas Town USA) is in Gaston County, a short drive from Charlotte. For more than 60 years the Christmas lights display has drawn visitors from all over Charlotte to see the hundreds of thousands of lights set the scene for holiday displays. Vote for your favorite houses among the competition that lines Gingerbread Lane at The Ballantyne Hotel & Lodge in December. The luxurious hotel holds a gingerbread house contest for professionals, amateurs and youth, and the houses are on display throughout month. Other hotel celebrations include adorning gingerbread houses and enjoying holiday afternoon tea. Sip craft beer, shop local products and indulge in freshly baked goods at The Olde Mecklenburg Brewery’s annual Weihnachtsmarkt. The event honors the German tradition of a Christmas market, where vendors sell goods from open-air booths. The fun-filled event runs over several weekends during the month of December in the brewery’s famous biergarten. For only $35, you can choose a vessel, select a fragrance and then measure, mix and pour to create your own candle. The temporary space, located at 1800 Camden Road, will function as a pop-up until their permanent home at the Design Center opens next spring. The Candle Bar is open Tuesday through Friday noon – 8 p.m., Saturday 11 a.m. to 8 p.m. and Sunday noon – 5 p.m. Walk-ins are welcome or book online in advance to secure a spot! Join Clara as she encounters an epic battle between the Mouse King and Nutcracker, a breathtaking snowfall, jumping candy canes and the iconic Sugar Plum Fairy. Complete with choreography by Jean-Pierre Bonnefoux and music from the Charlotte Symphony,. Whether it’s a treasured family tradition or you’re experiencing it for the first time, Nutcracker promises wonderful holiday memories for years to come. Santa Claus is coming to town for the fourth annual Breakfast with Santa at the NASCAR Hall of Fame. This all-inclusive experience includes breakfast, a visit and picture with Santa, crafts and reindeer games, plus much more. As an added bonus, each child ticket to Breakfast with Santa includes same-day complimentary admission to the ice rink on the NASCAR Hall of Fame Plaza. Tickets: to the NASCAR Hall of Fame Breakfast with Santa are $25 per adult and $22 per child between 3 and 10 years of age. Children under 2 are free. Advance purchase required, Saturday, Dec. 22, and Sunday, Dec. 23, two sessions at 8:30 a.m. and 10:30 a.m.
Posted on November 28, 2018 December 5, 2018 by Sarah Apperson	| Categories: Charlotte Real Estate | Bookmark the permalink.